It started in the spring, as white flowers bloomed on a bush outside Jane’s window. She picked the small flowers and hung them to dry around her bookcase. Already, she was thinking about the joy they could bring. 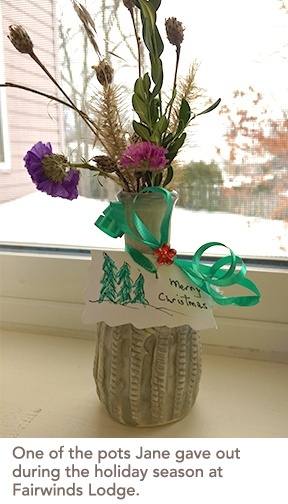 During this past holiday season, Jane made about 140 small white vases for team members and her fellow residents at Fairwinds Lodge Retirement Residence in Sarnia. Each was filled with small flowers and grasses, which she picked and dried herself. Clay has been in Jane’s life for as long as she can remember. 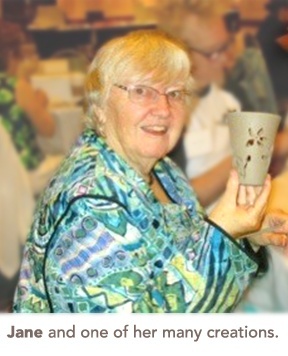 As a child growing up near the banks of Lake Huron, Jane and her mother would make dishes and tea pots out of the clay they found near the shore. Their creations would live until the next “good rainstorm,” according to Jane. But the clay was always there waiting to be moulded into something new on the next sunny day. And then one day, she forgot about clay. WWII came, bringing three children from England to live with her family. They were the children of a friend of Jane’s father, who had offered to look after the children because of the Nazi bombing raids. Clay came back into Jane’s life while she was taking a course at Fanshawe College. Jane believed the course, Art for Preschool Teachers, would go well with her certificate in Early Childhood Education from Ryerson University. Jane and her class were assigned to do a presentation on an art project that would be suitable for both preschool children and adults. Jane did her presentation on decorative Ukrainian Pysanka Easter eggs. One of her classmates did a presentation on clay. “She said you could take a course at Pinecroft pottery, so that summer I took the course,” Jane said. Jane was hooked. Only a few months later she started taking ceramics classes at Lambton College. It was the first time Lambton had offered courses in ceramics. That was in 1972; Jane has been taking pottery courses ever since. In 2016, at the age of 82, Jane earned a Liberal and Visual Arts Certificate from the college. Empty Bowls is an initiative that seeks to end hunger. It takes place annually in many communities, and raises money for the local food banks. The project started at Lambton College in 2007, where Jane was not only a student, but also a professor, now retired. However, Jane had been involved in the project for three years prior to the college’s involvement. Jane and about 10 other potters in the community come together to make 500 soup bowls for the event, with Jane herself making 50-70 bowls a year. Soup is donated by local restaurants, bread by bakers, and music is played by high school students. Ticket buyers pay $25 for a bowl of soup, bread and entertainment. At the end of the night they take their bowl home with them, to remind them of those less fortunate than themselves. According to the Lambton Shield, a local paper, the initiative has raised $80,000 for local food banks. “The event almost sells itself out now, it's that well known in the community,” Jane said. "We have musical groups that play or sing while the meal is going on and there's nice table decorations that we have made. It’s really quite classy for soup and bread."